EVERY TICKET TO THE TURTLES ALL THE WAY DOWN TOUR COMES WITH A DEFINITELY-SIGNED COPY OF TURTLES ALL THE WAY DOWN. TOUR INFO AND TICKETS HERE. I DON'T MEAN TO SHOUT BUT THIS IS A PRETTY GREAT SITUATION. Okay, back to the probably-signed Turtles. Sorry for shouting. John Green has signed 200,000 U.S./Canadian editions of his new novel, Turtles All the Way Down. Here you'll find information to help you increase your chances of acquiring a signed copy, although no guarantees! The book is published on October 10th, 2017. There are two ISBNs for Turtles All the Way Down, the unsigned edition and the (probably) signed edition. If you'd like to preorder a (probably) signed edition from your local bookstore, mention the ISBN when you order, whether that's by phone, email, or in person. 1. I live in a country that is not Canada or the United States of America. Does my book have a chance at being signed? The 200,000 pages John is signing will go into the U.S./Canadian editions of Turtles All the Way Down. If you do not live in the U.S./Canada, John encourages you to support your country's publishers, but all 200,000 sheets will be going into U.S./Canadian editions. 2. What's that ISBN thing you keep talking about? ISBN stands for International Standard Book Number, the unique number assigned to a book that also identifies its publisher among other things. It's the number underneath the barcode on a book. 3. How do I preorder a book in person? At your favorite bookstore, go up to the front desk where you pay for books and say "Hi, I would like to preorder a copy of John Green's new novel Turtles All the Way Down. I have the ISBN of the edition I'd like." The ISBN for the (probably) signed edition is 978-0-525-55538-4. They'll usually ask for your name, a contact number and/or email, and they may ask for payment upfront or when you collect the book. 4. How do I preorder a book by email? 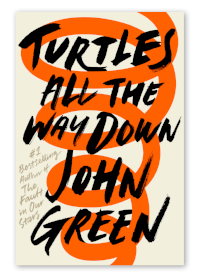 I'd like to preorder a copy of John Green's new novel TURTLES ALL THE WAY DOWN. I'm specifically interested in the signed edition, ISBN 978-0-525-55538-4. My name is ________, the best email to reach me is ____@____, and the best contact number for me is ________. Please let me know if you need any more information from me. If you won't be able to collect the book and need the bookshop to post it to you, just let them know, but the bookshop will likely add extra to your total for postage and may not know your final total until the book is in and they can weigh it at the post office. 5. How do I preorder a book by phone? Find the phone number of your favorite bookstore on their website and/or Facebook page. If you're looking for a local independent bookstore, IndieBound's Indie Store Search lets you search by zip code and most results include a phone number. Dial the number and when someone picks up, you can say, "Hello, I'd like to preorder a copy of John Green's new novel Turtles All the Way Down. I have the ISBN of the edition I'd like." The person on the other end of the phone will then likely prompt you to read the ISBN (978-0-525-55538-4) and ask you for your name and contact information. Sometimes they'll also require payment over the phone (but not always). Again, if you won't be able to collect the book and need the bookshop to post it to you, just tell them, but know that they will likely add extra to your total for postage and may not know your final total until the book is in and they can weigh it at the post office. 6. How do I preorder a signed copy on Amazon.com or barnesandnoble.com? Additionally, many branches of Barnes & Noble across the US still have signed copies available for preorder if you call the store or order in person. You can find your nearest store and contact information here. 7. How do I preorder the audiobook? The ISBN for the audiobook (US/Canada) is 978-0-525-59102-3. Audiobooks (or their casing) will not be signed.